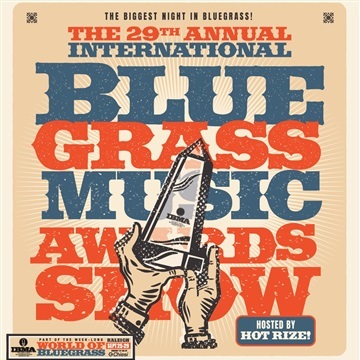 The International Bluegrass Music Awards Show, hosted this year by Hot Rize, is the biggest night on the bluegrass calendar. The awards recognize outstanding achievement and pioneering efforts in the genre as determined by professionals in the bluegrass music industry. The Awards Show features outstanding performances by the best in bluegrass and once-in-a-lifetime moments. Celebrate bluegrass music with the IBMA Awards! Performance 1 HOT RIZE - "Your Light Leads Me On"
Performance 2 BECKY BULLER - "Speakin to that Mountain"
Performance 3 SPECIAL CONSENSUS "Way Down the River Road"
Performance 4 - I'M WITH HER - "See You Around"
Performance 5 - RICKY SKAGGS & KENTUCKY THUNDER w/ MARTY STUART - "Raw Hide"
Performance 6 - MOLLY TUTTLE - "Good Enough"
Performance 7 - JOE MULLINS & THE RADIO RAMBLERS - "If I'd Wrote That Song"
Performance 8 - The Gibson Brothers - "Don't Forget the Coffee, Billy Joe"
Performance 10 - MICHAEL CLEVELAND & FLAMEKEEPER - "Bluegrass Breakdown"
Performance 11 - DEL McCOURY BAND - "Hot Wired"
Performance 12 - PAUL WILLIAMS w/ RICKY SKAGGS & KENTUCKY THUNDER - "Hold What You Got"
Performance 13 - BALSAM RANGE - "The Girl Who Invented the Wheel"
Performance 14 - THE EARLS OF LEICESTER - "White House Blues"
Performance 15 -FIRST LADIES OF BLUEGRASS & FINALE - "Swept Away/Sally Ann"